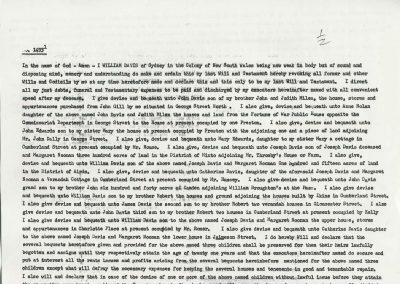 » DAVIS, William DAVIS, William | Cape Banks Family History Society Inc.
William DAVIS was born in 1768 at Birr (Biorra), Co. Offaly (King’s County), Ireland to Joseph DAVIS and Margaret NOLAN. William DAVIS arrived in the colony on 16th February 1800, after leaving Cork, Ireland on 24th August 1799, on the convict ship “Friendship (2)”. He was sentenced to transportation for life in November 1798 for being a “political prisoner”. 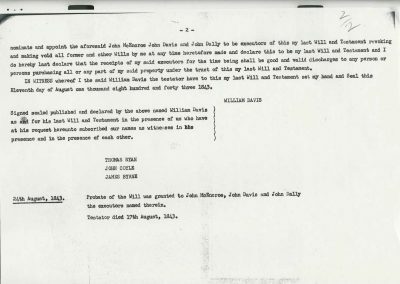 William was probably a member of the “Society of United Irishmen” which was a liberal political organisation that was seeing parliamentary reform. It launched the Irish Rebellion of 1798 with the objective of ending British monarchical rule over Ireland and founding a sovereign, independent Irish republic. 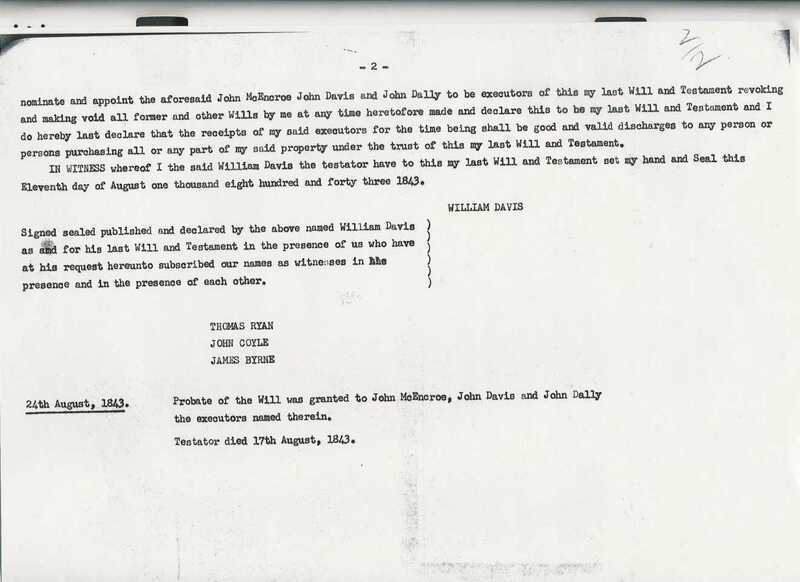 There is a possibility that William DAVIS participated in the 1804 convict rebellion at Castle Hill, along with other Irish patriots, who were transported to the colony for their part in the “Great Rebellion” of 1798. In 1809 William DAVIS married Catherine MILES. Catherine was tried at the Surrey Assizes on 27th March 1805 and sentenced to 7 years transportation to New South Wales. She arrived on the Alexander (1) in 1806. William DAVIS received his “Conditional Emancipation” on 1st July 1811. 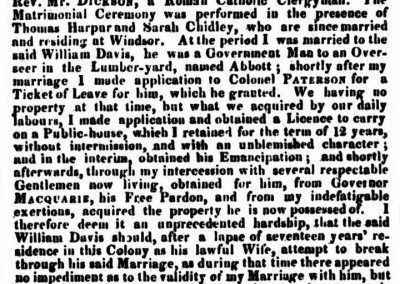 William DAVIS received his “Absolute Pardon” on 31st January 1814. By March 1826 the marriage of William and Catherine broke down and they separated. Catherine returned to Europe where it was alleged by William that she already was married and her husband was living in Ireland. 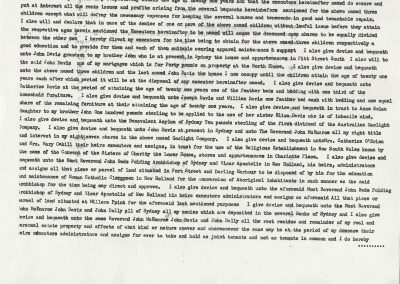 William placed advertisements in various newspapers stating that he would not be paying any of debts that she may have accrued in his name. Catherine replied to his claims through various newspaper advertisements. 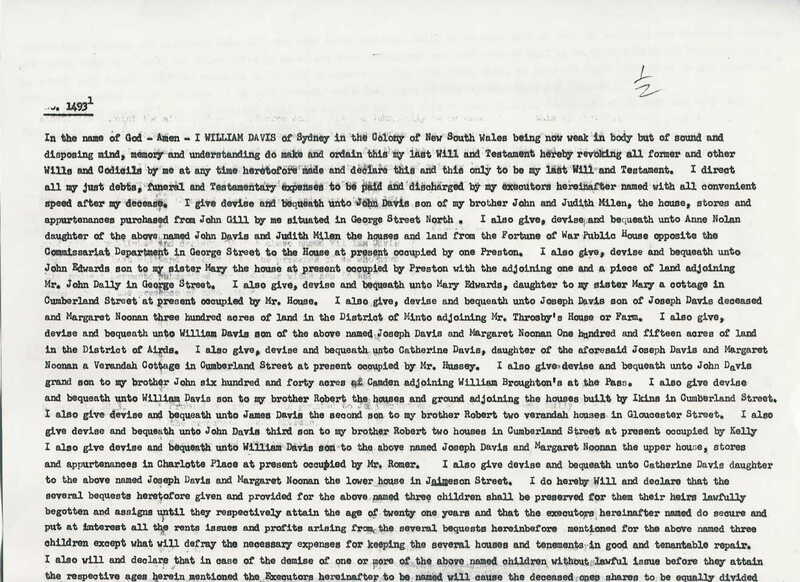 “WHEREAS I Catherine Davis, of Cambridge Street, Sydney, arrived in this colony in September 1808 , and intermarried with my present husband, William Davis, in January 1809, at Parramatta, by the Rev Mr Dickson [Dixon], a Roman Catholic clergyman. The matrimonial ceremony was performed in the presence of Thomas Harpar and Sarah Chidley, who are since married and residing at Windsor. 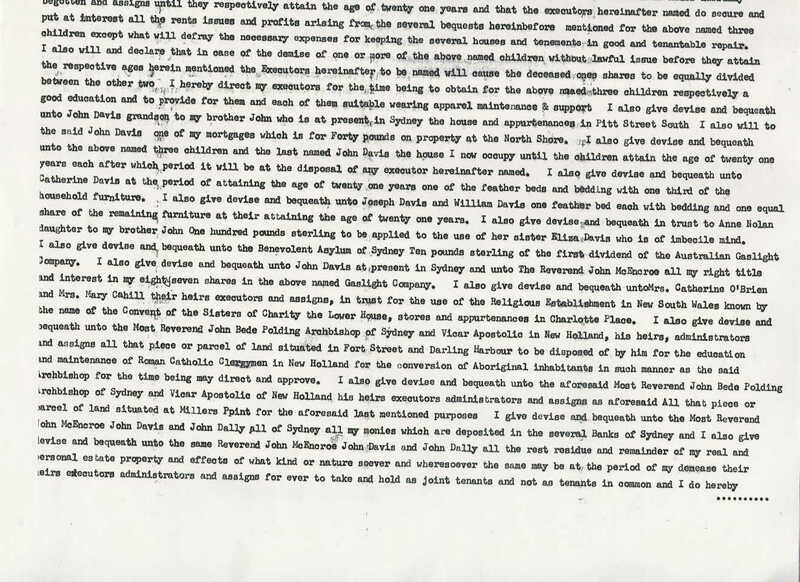 At the period I was married to the said William Davis, he was a government man [convict] to an overseer in the lumber yard, named Abbott; shortly after my marriage, I made application to Colonel Patterson for a Ticket of Leave for him, which he granted. We having no property at that time, but what we acquired by our daily labours, I made application and obtained a license to carry on a Public house, which I retained for the term of 12 years, without intermission, and with an unblemished character; and in the interim, obtained his emancipation; and shortly afterwards, through my intercession with several respectable gentlemen now living, obtained for him, from Governor Macquarie, his free pardon, and from my indefatigable exertions, acquired the property he is now possessed of. 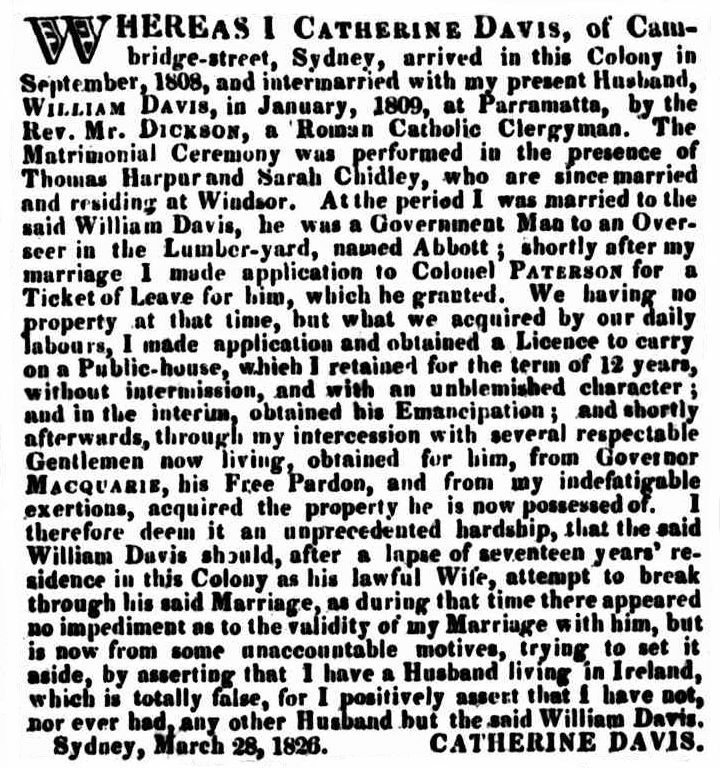 I therefore deem it an unprecedented hardship that the said William Davis should, after a lapse of seventeen years residence in this colony as his lawful wife, attempt to break through his said marriage, as during that time there appeared no impediment as to the validity of my marriage with him, but is now from some unaccountable motives, trying to set it aside, by asserting that I have a husband living in Ireland, which is totally false, for I positively assert that I have not, nor ever had, any other husband but the said William Davis. Sydney, March 28, 1826. They seemed to have reconciled their differences and lived out their lives together until Catherine’s death in 1839. The second church to be built made more of a national statement. On 25 August 1840 William Davis, transported as an Irish rebel in 1800, stepped forward at a large Irish and Catholic gathering in the Rocks and placed a cheque for £1,000, an enormous sum, on the foundation stone of St Patrick’s Church. Davis also gave the site for the church. St Patrick’s was opened on 18 March 1844, the day after St Patrick’s Day to prevent the possibility that such a gathering on the saint’s national day would be marred by inebriated revellers. The ceremony was preceded by a large parade, from St Mary’s, down King and George streets, and up Charlotte Place, featuring the St Patrick’s Band, the St Patrick’s Total Abstinence Society and the members of the St Patrick’s Building Society. The banners of the societies were carried in front of the parade and it would have been clear to all that Irish and Catholic Sydney was on show. It was, so it is said, the largest public parade of its kind yet seen in Sydney. The city’s Catholic paper, the Morning Chronicle reported the occasion; The Sydney Morning Herald ignored it. Mr. William Davis, of Church-hill, has presented the Roman Catholics of that quarter, with a valuable site for a chapel, etc. It is valued at £1,000, and he has also signified his intention of having an annual subscription of £20. A meeting was held on Monday 1st June 1840 for the purpose of approving the construction of a Catholic Church in the north-west division of Sydney, known as Church-hill. A motion was put forward and approved for this purpose and the church would be called St. Patrick’s Church. By June 1843 the stonework was complete. The building was 116 feet long by 37 feet wide. The construction of the roof was to be completed and it was expected that William DAVIS would make a considerable donation towards its completion. The church was opened on Monday 18th March 1844. 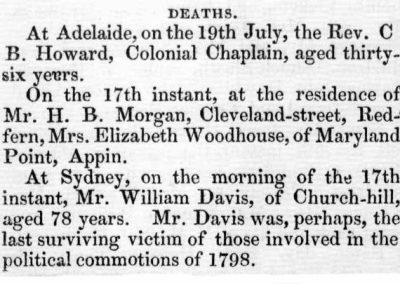 William DAVIS died 17th August 1843 at Church-Hill, Sydney, aged 78years. 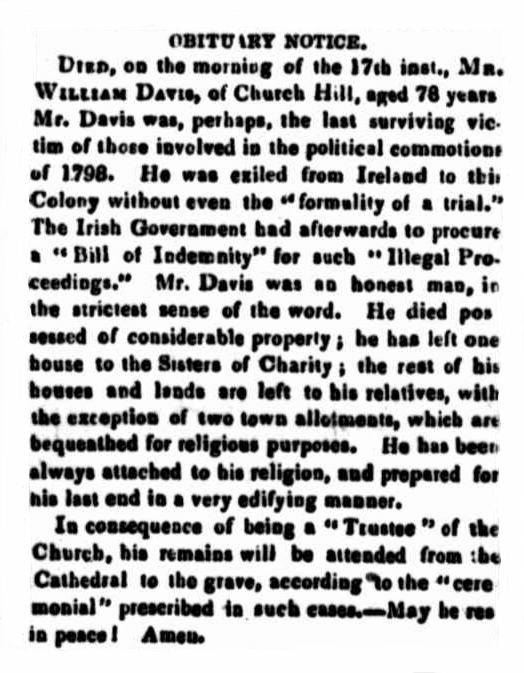 Died, on the morning of the 17th inst., Mr. William Davis, of Church Hill, aged 78 years. 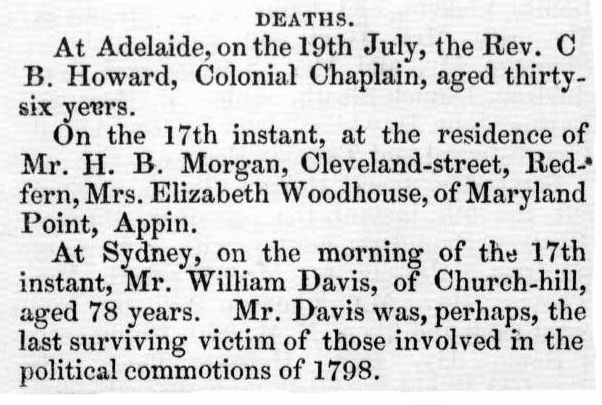 Mr. Davis was, perhaps, the last surviving victim of those involved in the political commotion, of 1798. 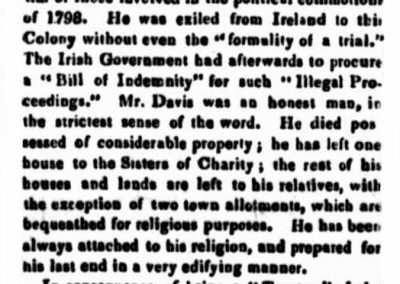 He was exiled from Ireland to this Colony without even the “formality of a trial.” The Irish Government had afterwards to procure a “Bill of Indemnity” for such “Illegal Proceedings.” Mr. Davis was an honest man, in the strictest sense of the word. He died possessed of considerable properly; he has left one house to the Sisters of Charity; the rest of his houses and lands are left to his relatives, with the exception of two town allotments, which are bequeathed for religious purposes. He has been always attached to his religion, and prepared for his last end in a very edifying manner. In consequence of being a “Trustee” of the Church, his remains will be attended from the Cathedral to the grave, according to the “ceremonial” prescribed in such cases. – May he rest in peace. Amen.